AUTHOR: Carmen has always had a love of words, spending many summers of her childhood reading as many books as she could get her hands on. Her love of reading led to a love of writing, which started out with keeping diaries and journals since age ten, and ultimately led to her desire to write a novel. She was born and raised in Southern California, and still lives there with her husband. 5.0 out of 5 starsFell in love with the characters! 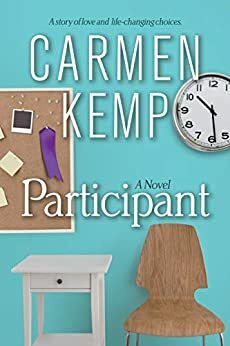 I loved the story line of Participant but I loved the characters even more. The young women in this book are so relatable. They each have their characteristics that make you love them, but then their little quirks that just make you want to smack them. A lot like the people you know in real life! I enjoyed following them on their journey. If you've ever questioned yourself, felt stuck in a dead end job or wondered what the heck you were doing with your life, you will relate to and enjoy this book. 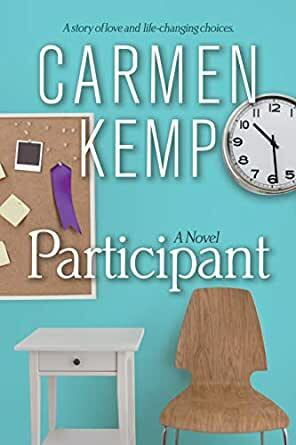 The Participant is well written and relatable especially if you are at a stage of life where you are floundering and trying to find yourself. It provides a realistic portrayal of the varying emotions you can go through as you navigate to your happy place. The main character has always felt inadequate to the point of wanting to end her life. This inadequacy leads to poor life choices in relationships and work. But she's always had a passion for modeling and acting and she finally listens to her inner voice. We go along on this fun journey with her as she discovers happiness. Without meaning to there are lots of life lessons in this book. A good read. 5.0 out of 5 starsGreat beach read! Although I read this while on vacation you certainly can read it anytime. I love that it highlights stepping out of your comfort zone and doing something completely out of character and finally figuring out who you were all along. It's about how life has ups and downs and that nothing is certain but your outlook is what makes a world of difference. I was surprised to find myself shed a few tears because I found myself relating to the main character more than I expected I would. Highly recommend! It’s a story of a woman that has allowed herself to be bogged down by life at a young age, but learns to find and fight for her own happiness in life! I say surprisingly, because this is not the type of book I usually enjoy. However, I received a complimentary copy, so one rainy afternoon I decided to read it. Alexis hates her job and her relationship with her fiancé is not fulfilling. All in all, her her life is depressing. Things only get worse when her fiancé packs up and leaves. So one day she takes a leap of faith and signs up for acting and modeling classes. Much to her surprise she loves acting and blossoms. One day she gets some news that forces her to choose between the needs of someone else and her own needs. The character development in this book is excellent, the story line is quite good.